Go Fish! Ponyo gets a first glimpse of the surface world in Hayao Miyazaki's latest masterpiece Ponyo on a Cliff. The Skinny: A whimsical, fantastic and visually amazing film that is a pure delight for all ages. Hayao Miyazaki's eighth film for Studio Ghibli, Ponyo on the Cliff (Gake No Ue No Ponyo) is a wonderfully fun and imaginative look at childhood. At a time when it seems that film animation has been dominated by Disney/Pixar's CGI masterpieces, it is both refreshing and comforting to know that Miyazaki is still relying on traditional hand-drawn animation to tell his charming and enchanting stories. The story revolves around the friendship between a magical sea sprite/goldfish and the human child that she encounters during a curious outing to see the human world. The human child, Sosuke (voiced by Doi Hiroki) lives in a small house on a cliff overlooking a small port city in Southern Japan (based on Seto Island) where he lives with his young mom, Lisa (Yamaguchi Tomoko). Sosuke names the strange goldfish "Ponyo" and takes it to the daycare/nursing center that Lisa works at. Ponyo is definitely not your typical goldfish and soon begins to adapt and take on human aspects (she develops human speech and an appetite for ham meat) after sampling some blood from a cut on Sosuke's finger. Yet just as Sosuke and Ponyo begin to develop a bond, Ponyo is taken back by her father, Fujimoto (Tokoro Joji) who is a former human who has rejected the surface world and is now attempting to collect and develop magical elixirs taken from the sea that aid him in repairing and rejuvenating the world's oceans. However, Ponyo's desire to become human has become so strong that Fujimoto is unable to contain her anymore, and she breaks free from her waterworld home and goes back to see Sosuke. 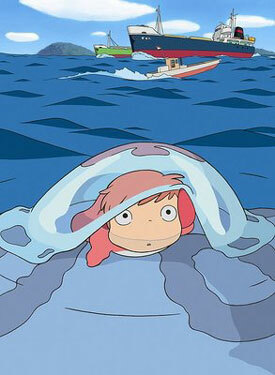 During her breakout, Ponyo unintentionally releases Fujimoto's cache of magical elixirs, which unleashes all sorts of magical sea creatures and causes a violent storm in the seas surrounding Sosuke's town. Desperate to resolve Ponyo's rebellion, Fujimoto calls upon the help of Ponyo's mother, a water elemental dubbed the Mother of the Sea (voiced by Amami Yuki). As with Miyazaki's past films, Ponyo on the Cliff touches upon various themes of ecology and environmentalism, this time focusing on the health and vitality of the world's oceans. The opening sequence is at times sobering when Ponyo encounters a drudging vessel which is scraping the ocean's floor, uncovering mountains of garbage and debris. One can understand the anger and frustration of the character of Fujimoto who has spent his lifetime trying to repair the damage civilization has done to its oceans, yet finding it an daunting and almost fruitless endeavor. Enough cannot be said of the remarkable animation in this film. It is at times bizarre and outrageous but at the same time charming and curious. Clearly Miyazaki wanted to capture the sense and style of a child's imagination. The art style has the appearance of crayon/pencil drawings and is wonderfully colorful and fanciful. It is almost like a child's coloring book come to life. Child actors Nara Yuria and Doi Hiroki do great work as Ponyo and Sosuke, bringing adorable charm to their roles. Nara Yuria in particular sounds so darn cute as Ponyo that it is little wonder that Doi's Sosuke falls for the magical girl. Former model and actress Yamaguchi Tomoko (Swallowtail) is also very good in her role as Sosuke's modern mom, Lisa. I was a bit confused at first by her character as I initially thought she was Sosuke's older sister. It also didn't help that Sosuke kept referring to her as "Lisa" rather than Mom, but I guess it is perhaps a sign of the times and an indication of the modern Japanese family (in the anime series Crayon Shinchan, Shinnosuke also refers to his mom by her first name). 80's comedian Tokoro Joji sounds totally different as the serious Fujimoto but wisely doesn't make his character sound cartoonishly menacing. While we don't learn much about his character, former pro-baseball player and actor Nagashima Kazushige also delivers some nice voice work as Sosuke's father Koichi. The opening theme "Umi No Okasan" by Japanese soprano Masako Hayashi is simply beautiful and stirring. In contrast the Fujimaki Fujioka and Nozomi Ohashi "Geke No Ue No Ponyo" theme is light and amusing, and evokes images of a traditional Japanese nursery rhyme. During one brilliant sequence the soundtrack takes on an almost Wagnerian operatic sound with music that sounds like "Die Walkure". However, the film is not perfect and does suffer from moments where the central story of Ponyo and Sosuke takes a back seat to some of Miyazaki's overwhelming fantastical visuals. I also wish there was more time to explore Fujimoto's backstory, as well as the relationship between Sosuke and his father.